The epic enemies often depicted for dinosaurs consist of Triceratops vs. Tyrannosaurus Rex. Humans just love imagining the fights that may have raged between these two. However, dinosaurs aren’t the only creatures they imagine battles for. Zooneden creatures have their own enemies as well. The most famous example would be the Smilodon vs. the Mammoth. 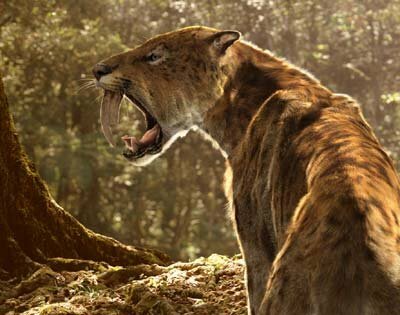 For those of you who do not know, Smilodon is the scientific name for what we like to call sabre-toothed cats. Smilodon as a family will be explored right now but our main subject will be Smilodon populator. The only thing that really makes Smilodon stand out for the average human being, is the massive canine teeth protruding from their upper jaw. These teeth, depending on the species of Smilodon, could be a foot long and be exposed from the mouth . . .